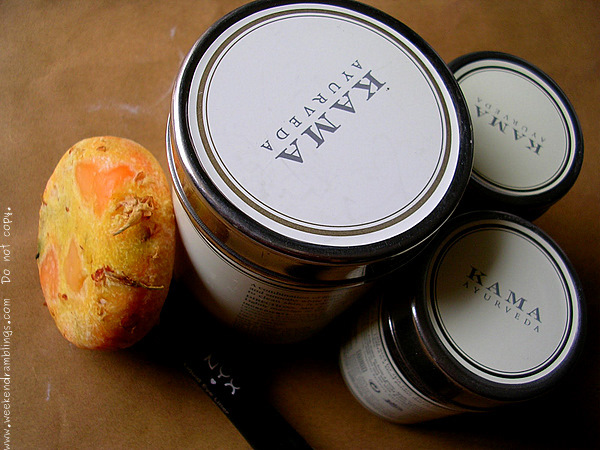 I have never tried anything from Kama Ayurveda before. I loved the steel tins the products come packaged in. From cute packaging to no packaging - Lush shampoo bar, Godiva (Review HERE). History and English lessons over. 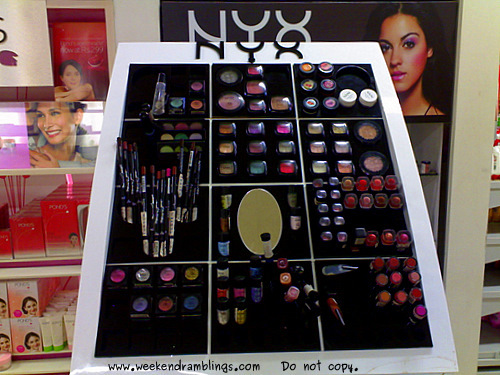 I found a small NYX counter at Hypercity, and the SA there was super helpful and friendly. I picked up only an eyeliner - didn't really want anything because I don't really know what's good and what's not at NYX. Did you all do anything useful or just sit at home sipping chai and chit-chatting??? Shiseido's Pureness range is one of their basic, less expensive lines, and it is marketed toward a younger customer - those with oilier skin types and who would prefer a more economical product. The key ingredient in this range is Palo Azul and Pureness oil-absorbing complex. I have combination-oily skin type, and this range is recommended for my kind of skin (as well as oilier skin types). I picked the Shiseido Pureness Mattifying moisturizer after trying out and loving a couple of samples. The moisturizer is housed in a heavy frosted glass bottle and comes with a pump dispenser that does a good job of dispensing the product. The moisturizer itself is quite lightweight, gel-like lotion, and it has oil-abosorbing powder mixed in to help blot out excess oiliness. This does have alcohol listed in the ingredients list (check below for complete list), but it has not irritated my skin, caused any sensitivity/burning, or caused/exacerbated any dry patches. The product itself is a thin gel-like consistency. There is a light, clean fragrance to it that I barely notice now that I have been using the moisturizer regularly for a while. I use about 3 pumps for my face and neck area. The moisturizer is easy to spread and absorbs easily into the skin, leaving skin hydrated as well moisturized. Thanks to the oil-absorbing powders, it leaves my skin feeling smooth to touch and I do think it stays looking fresh all through the day. Shiseido Pureness Mattifying Moisturizer is my current favorite summer-time light-weight moisturizer for my skin type. It leaves my skin hydrated and my skin looking fresh. The mattifying effect is just right - healthy, clean-looking skin without too much of a dry, chalky look. I have not had any breakouts or skin sensitivity with using this product either. Apart from the Shiseido Pureness Moisturizer, I also use an alcohol-free toner/softener from Shiseido The Skin range, which is a little more hydrating to the skin. The combination of these two products works best for my oily-combination skin type, adding moisture into the skin rather than heavy oils. For winters, I think I might need a slightly heavier lotion/cream. Its just starting to get a little cold here, and I already am using more product than I used to earlier. Update (Dec 2016) - My current favorite moisturizer is Belif Aqua Bomb. I also use SKII products - SKII Face Mask and my toner/softener routine now includes SKII Facial Treatment Essence and SKII Facial Treatment Clear Lotion. Foot masks are something I started using only recently - I am finding are quite a treat for my feet. Working very much like their counterparts for the face, they promise to leave your feet clean, fresh, and happy. The two products I am comparing here are the only two masks I have tried. Claim: Deep cleansing clay and refreshing community trade peppermint oil soothes and purified tired feet. Massage onto feet, leave for 10 minutes, rinse off. This is a creamy paste that comes packaged in a tube. You squeeze out enough to generously coat your feet, wait for 10 minutes, wash off. It comes off easily enough with water and feels a bit soapy. Used this way, it is at best an okay mask. I get better results when I apply this and then wrap my feet with cling wrap. I feel it helps the oils in the mask to soak in better. The tube packaging. Ensures the product does not dry out, very easy to use. The mint gives a fresh feeling to the feet soon as you apply this mask. It does not dry out, so no bits falling all over the place. Has a comparitively longer shelf life. The tube I have is missing its expiry date sticker, but generally most TBS products have pretty long shelf lives. Claim: This thick effective mask has clays to draw out deep-down-dirt, fresh papaya and lemon for cleansing, deodorising tomatoes, astringent herbal decoctions and anti-fungal essential oils. Plaster your feet, wrap them up in saved plastic and read a book for ten minutes. Unwrap, massage the mask into your feet to scrub off dead skin cells. Rinse thoroughly for a lovely fresh feeling. Cover your feet in Volcano mask, wrap them in plastic bags or film, leave on for 10 minutes. Then massage in to scrub away old skin and rinse off thoroughly. I use it exactly as per instructions - prefer using cling wrap to the plastic bags because they..errr..cling better :P This mask isn't named Volcano for nothing. Your feet go warm and then cold, and warm and then cold. You can help things move along better by just covering your feet with a warm towel or a blanket or some really loose socks. While washing off, scrub the mask off, and there you have it - clean, soft feet! The thing about Lush is, they stuff their products with all the fruits and vegetables they can lay their hands on. Just take a look at the ingredient list, and you will know. Companies that claim to use natural products command a higher price tag, and with Lush at least I am getting a lot more of the naturals. To start of, this is not the easiest product to spread on. It is a thickish grayish product - you scoop it out of the tub and spread it on. Easier said than done! It tends to go on clumpy because it is just about barely moist, and you make a not-so-pretty mess all around wherever you are sitting because of bits falling off. Of course, once you wrap your feet its all over, but still, its a pain until then. The product comes with an expiry date of about 3 months, I think. If you are not careful, though, you will end up with the product drying up in the tub long before that! Make sure you keep the tub closed properly at all times. I have used the mask way beyond its expiry date, and it works perfectly fine. The hot-cold sensation isn't so obvious as it gets old, but it is just as effective on cleaning up my feet. As the product dries up in the tub, I just break it into chunks, make a paste with some water, and brush it on my feet. Scrub + mask in one product. More product for lesser price. However, if you don't use foot masks all that very regularly, don't mind extra step of soaking your feet for about 5-10 minutes in warm water and giving them a bit of a scrub, then go for the TBS Peppermint Mask because its non-messy and lasts longer. So which one would you prefer? Any other recommendations for a good foot mask? New at Chanel, these are the shades that I saw at Lifestyle. For anyone looking for swatches of this, hope this helps. These are the testers kept at the counter. The actual packaging is what is shown in the ad. The texture seemed a bit thicker than a regular Chanel gloss, are nonshimmery, and seem more pigmented. Definitely not as thick or pigmented as the Laques, though. 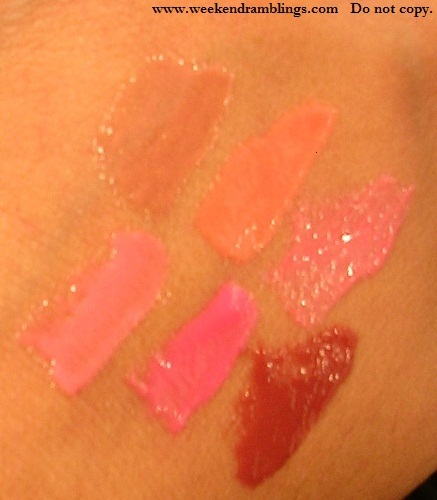 Swatches on Hand: Top: L to R: Insouciance, Genie, Confidence. Bottom: L to R: Imaginaire, Insolence, Impertinence. Top: L to R: Insouciance, Genie, Confidence. What's better than a Chanel? Small enough to fit into a clutch and perfect for traveling, these are my favorite :-) What's your favorite fragrance/deo - any brand, any price? I woke up bright and early today - at 8 in the morning - and it's a dreary cloudy day that is greeting me. Much as I appreciate that the horrible summer heat has finally gone, I do wish there was a bit of a sun every once in a while. Guess I am never satisfied! Well, I thought, what better way to brighten up the day than look at some Chanel goodness, and so here is some stuff I picked up. Sorry about the pics, it really is cloudy here today. 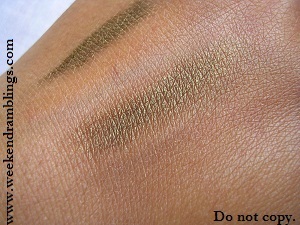 Ombre Essentielle - Vert Khakhi - soft touch eyeshadow. The only thing I picked up from the Chanel Fall 2010 collection ( Les Contrastes de Chanel - Fall 2010). Les 4 Ombres - Bird of Paradise - eyeshadow quad. This is a limited edition quad from an older Chanel collection. Never bought until now because I never was an eyeshadow person. It's just recently, with other blog influences, that I have started trying them. Le Blanc de Chanel Sheer Illuminating Base - a concept I was totally ignorant of until very recently! Not what my makeup instructor recommended, but I think this just might work for me. Do you have a problem with hair getting weighed down with haircare products you use or just appearing limp after a few washes with your regular shampoo? For me, the solution is using a shampoo that cleans out all the junk that has deposited on your hair over time leaving it squeaky clean. Depending on how much I would want to spend, these are my two options - a save and a splurge. Pantene Lively Clean is a transparent, clear shampoo that claims to revitalize oily limp hair to lively, healthy looking hair. It smells just like any other Pantene product - I really don't know how else to describe it! The shampoo does a good job of removing any dulling residues and does leave my hair quite shiny. I definitely need to follow up with a conditioner as usual. The only downside with the Pantene Lively Clean shampoo is it does leave my scalp a bit itchy. Lush I Love Juicy shampoo is a fresh fruit, jelly shampoo with mango, pineapple, kiwi, and papaya for cleansing greasy hair. This is a brownish-yellowish coloured shampoo with an amazing fruity fresh fragrance. The Lush I Love Juicy shampoo has loads of lather and leaves my hair squeaky clean. While it is strong enough to remove all the grime, oil, and/or any dulling residue from my hair, it does not leave my hair stripped and dry looking. I do need to follow this up with a conditioner as usual, though. Best used if you have hair that tends to get greasy or if you treat your hair to an oil massage before the wash. I have dry hair, and I use them simply because I need something effective enough to get rid of the oil I massage in. These are great to wash you hair with prior to a henna application. Squeaky clean hair picks up the colour better. ABSOLUTELY HAVE TO use a conditioner following any of these shampoos. I don't know if the softer-haired people can get away without one, but I have to use a conditioner. No choices about that. My wallet-friendly conditiner option is Dove Conditioner - Breakage Therapy Repairing Serum (easier described as the blue Dove), and the splurge option is Lush Retread (review here). Clarifying shampoos can cause hair to get dry with frequent use, though I think this is not a problem at all if you are in the oil-before-you-wash category. Just ensure that you follow up with a good conditioner. If you have colour-treated hair, I think these two aren't that good an option because they can cause some degree of colour fading. This is just my opinion, but the common ingredient to both these shampoos, sodium chloride - salt, might be the culprit for this. So what's your shampoo for squeaky clean hair? These are two samples I got on my last purchase from Shiseido, and since they are pretty short reviews, I thought I might do both together. Both products are from The Skincare range from Shiseido. The products in this range are meant for normal skin..not too oily, and not dry either. To let skin create its own moisture is the principle in this range. All the products in this line share a faint pleasant fragrance, which I really cannot describe. Its just there, and I do not think it would bother anyone at all. Both samples are 5 mL tubes, and in both cases the samples lasted me long enough to be worth a review. This is a white creamy-mousse texture. Take a small amount in your hand, work up into a lather, and then apply it over wet face. Pretty much like any other regular face wash, but you do need to use a lesser quantity than you would of regular face washes. The small 5 mL tube lasted a longish while. Leaves the skin clean - very clean - but absolutely not dry. Now, I do have a combination-oily/acne-prone skin, but this did not make skin oily or feel oily or inadequately cleansed. Just clean and moist. Takes off every bit of makeup that I might have on my face - makes me wonder how its so gentle yet works so well! I needed a lesser quantity than I would regularly use. Freebie Rating: Absolutely Yayyyy! In fact, after I am done with the face wash I am using currently, I might just hop, skip, and jump over to Shiseido and pick this up. This didn't work for me, and the reason I am reviewing it is, it might be useful for someoene else. Genes - loads of people in my family have them. Allergies - dust allergies which can cause dark circles under your eyes, plus my eyes get itchy so the constant rubbing doesn't do any favors either. My eyes are placed deeper in and so the undereye appears darker anyway because of lights effects!! I don't score any major points in the nutrition category either, thought that is something I am working on. The reason I listed this out is because, in my opinion, when we look for an eye cream it should be on the basis of these underlying reasons. I got this as a free sample, not something I picked out myself, and thefore, I think not the most ideal for my eyes. Texture wise, this is a very light gel that spreads easily. The small sample tube has lasted me ages, there's still loads left in it, because really, how much do you need for the eyes? That way, I think this was a very generous sample to try out. This is very light and spreads very easily. No pulling/tugging on the skin. That was a big plus for me. It gets absorbed very fast, no sitting on the eyelids for ever and ever, and it does not leave the eye area oily. This might be a big plus point for people with oily eyelids/undereye area. Cons: These are what didn't work for me. It was not moisturizing enough for my eye area. For some reason, I feel this made my eye area a tad darker and drier. Now I am assuming this is more of using the wrong cream for the my kind of skin. I probably need a more moisturizing cream. Same thing for dark circles. If its a temporary problem, this just might fix it. If you just need a basic eye cream and have oily eye area, well this might be light enough for you. Related post: Shiseido Hydro-balancing softener also from the The Skincare range. My skin tends to be sensitive to many creams - no, I do not break out into rashes at the slightest, but I get pimples pretty soon if my skin is not too happy with the moisturizer. I have a mix of oily and dry zones in my face, which pretty much rules out both the oilier creams as well as most mattifying products. The actual product itself is best described as on the box: A refreshing, water-based, oil-free texture for a unique sensorial experience: the comfort of a cream, the delicate lightness of a gel. Ideal in warm seasons. The only thing I would add to this - a faint soothing fragrance and a pale pink colour. Blends like a dream, and it does feel soothing to me. I do wish there was a recycling program for all these pretty jars. I cannot think of any use for this once I empty it, and I would feel really bad just tossing it in the bin. Hydra Zen's soothing action: Immediate relief for "stressed" sensitive skin. By sensitive skin, I don't think Lancome means skin that has had an allergic reaction. I think its meant for skin which is reacting to factors such as dust, varying humidity levels, etc. That clarified, I think this does a good job as a good basic moisturizer. It is "just right." Not oily, not dry..leaves the skin perfectly moisturized. It has a fragrance. I know this is a big no-no for many people, but I personally love it. It reminds me of roses, but is not too sweet a smell. Very mild, and to me, it does seem soothing. Intense hydration, immediately and for 24 hours: It does give immediate hydration, you can almost feel the moisture calming your skin when you apply it. For 24 hours? Never kept it on that long but my face never felt dry throughout the day. NeuroCalm complex combined with Centella asiatica extract: I did not find any mention of Centella asiatica in the ingredient list. Of course, I am not very well-informed about all the ingredients in the list, so never know. Would be happy to correct this if anyone explains it to me :-) To know more about this particular ingredient - Wikipedia to the rescue - you can read about it here. Alcohol denat is pretty high up in the ingredient list. That I know is a problem for many many people. I come in the undecided category. I used to be absolutely against alcohol-containing products, I am after all a HUGE Lush fan :-) I still prefer to use alcohol-free toners/softening lotions. That said, I have used a few moisturizer now that contain alcohol, and I have not noticed any extra drying of the skin. I read somewhere that the quantity of alcohol in these moisturizers is small enough to evaporate off easily when we apply the product and also to ensure that the gel/cream is not too oily. With this specific product, I have had absolutely no problem because of the alcohol content from what I can see/feel on my skin. However, I think its important to look at ingredient lists and make a decision based on that and, of course, trying out a sample/tester is always a good idea. Verdict: Lancome is a luxury brand, so if you don't mind paying the price, this is a very good basic moisturizer. It did not break me out or make my skin oilier, and in fact, my skin does look better when I am using this. I usually reserve this for the night, and use a Shiseido moisturizer for the day time. No particular reason other than I have to finish that too :-) I have tried this as a day time moisturizer, and it is just fine. However, I have not tried this in the summers, so cannot give an opinion on how it would hold up to our Indian summers.